Competitors can change their current division by login in to their SJJIF profile. All competitors must read the Important Tournament Information . Free spectator admission will be awarded to all SJJIF Members including coaches. All competitors registered by the 3rd deadline will receive a free tournament shirt. Shirts are to be picked up the day of the event at the NABJJF booth inside the venue. Be sure to include the tournament name, your name, what division you are in, and the changes to be made in the email. Weigh-ins are right before your division is scheduled to begin. Be sure to arrive at least 30 minutes prior to your scheduled division time. Athlete's are to weigh-in with the uniform they will be wearing to compete. Open weight division is only for juvenile competitors and above. Athletes have the option to register for the open at the time of registration for $10 whether they place in their division or not. SJJIF black belts can register for the open weight division for free. In the case that you do not sign up at the time of registration, athletes who place in their division also have the option to sign up for the open division for $10 (cash only), immediately after they receive their medal at the medal podium. Athletes that do not have a fight in their respective division, can sign up for the open weight division at no added cost immediately after they receive their medal at the podium. 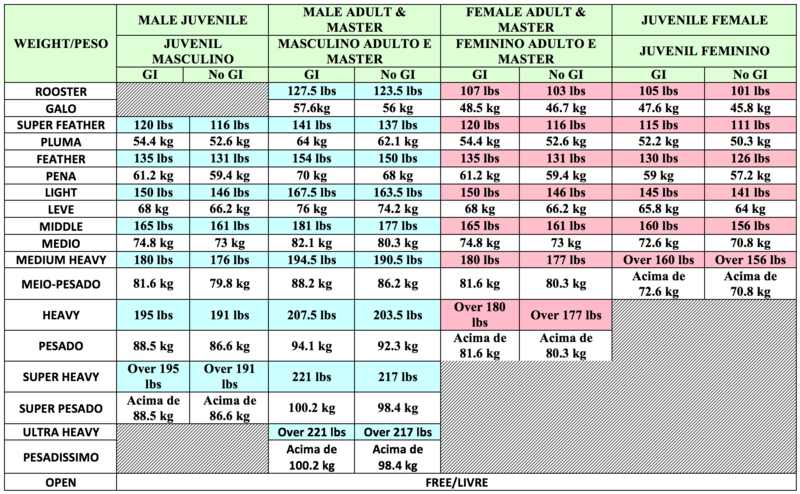 Divisions for the open weight are as following: Adult, Masters 30, Masters 36 and up are combined. Open Weight Division fee is not refundable. Kids brackets—In the case that your child is by themselves in the division we will notify you by email, text or phone call to discuss your child’s options. However, in some situations where your child is by themselves in the division, another competitor might move into your child’s division, in this situation you will not hear from our team. If you do not hear from our team by email, text or a phone call it means that your child has competitor(s) in his/her division. In the case that you do not respond to the email or call within 24 hours, we will then match your child based off the age, weight, gender, and belt provided in their registration. Juvenile Competitors and older—The NABJJF holds you accountable to review the competitor list and contact us in case there are any changes. Competitors will have up to the Division change deadline to move in division. In case you are the only person in your division after the check date you will receive a gold medal in that division and qualify to compete in the open weight division. If you want a match but are not sure where you want to move to, send us an email that you are willing to move and we will place you in the best available option. *Preliminary Schedule- Full schedule with times will be available on Wednesday on the week of the tournament. 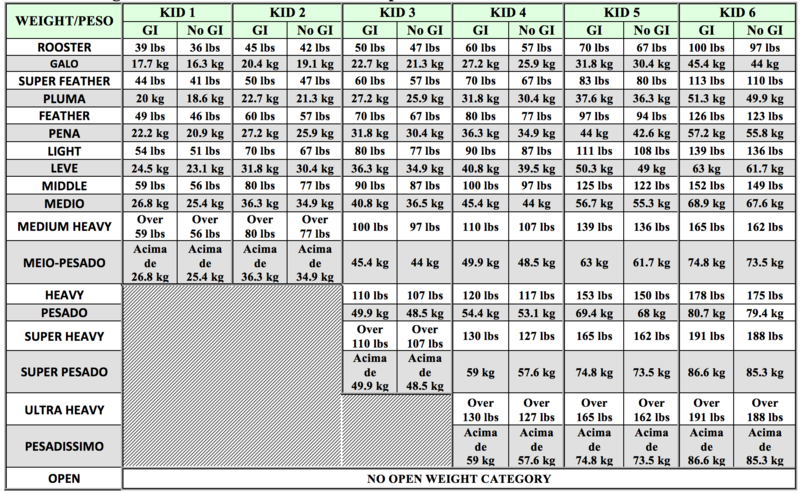 Open weight division is only for juvenile competitors and above. Athletes have the option to register for the open at the time of registration for $10 whether they place in their division or not. In the case that you do not sign up at the time of registration, athletes who place in their division also have the option to sign up for the open division for $10 (cash only), immediately after they receive their medal at the medal podium. Athletes that do not have a fight in their respective division can sign up for the open weight division at no added cost immediately after they receive their medal at the podium. Open Weight Division fee is not refundable and registration insurance does not apply.